Tourmax is a world first. It is the first flip up Adventure helmet on the market and has been designed to suit Enduro and Maxi Enduro bike owners. 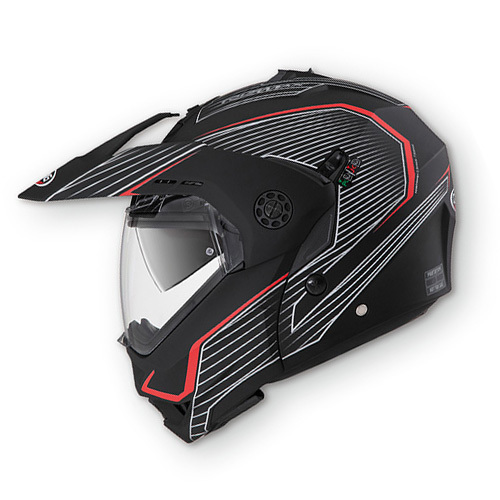 As a result of Caberg’s extensive experience and as the first company to produce flip up helmets the new Tourmax is absolutely unique in its design, functionality and quality. It is 100% Italian made and with a peak that automatically moves closer to the visor when opening the chin guard. Tourmax has recently received a 5 Star raating from Sharp. Tourmax comes with dual homologation P/J which allows you to ride with the chin guard open or closed. The lever in the “J” position locks the chin guard open. Tourmax is equipped with the exclusive Double Visor Tech system that easily allows the user to adjust the internal sun-visor. The inner sun visor is treated with anti-scratch while the outer clear visor is not only anti-scratch but also fitted with the anti-fog double lense Pinlock. Ventilation is guaranteed by two wide vents in the chin guard and on the shell that are easily operated with gloves. The air is channelled through groves on the inner liner that ensure fantastic ventilation. The lining is completely removable and washable, with breathable and hypoallergenic fabric for maximum freshness. Motorgear has brought in the Tourmax Sonic(graphic) in White base and also a Matt Black base. Tourmax also has seating to accommodate the Caberg Universal Bluetooth communication system “Just Speak Easy”. Lining: Completely removable, washable and sanitized with reflective inserts. Removable “stop wind”. 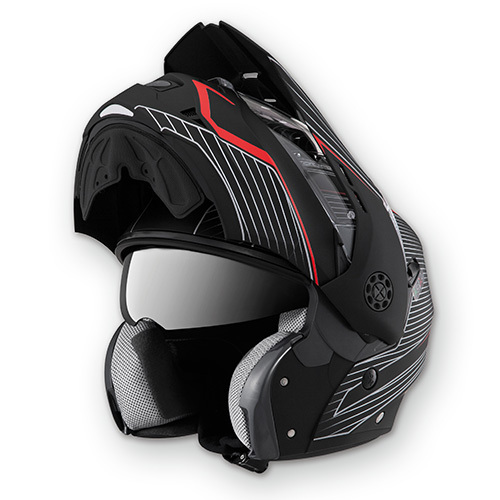 Ventilation: Chin venting to avoid condensation to the visor, adjustable top venting for extra flow. Visors: Double visor tech system, transparent, anti-scratch, Pinlock fitted as standard, anti-scratch sun visor.